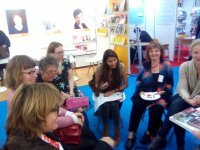 In partnership with the Kurt Wolff Stiftung (collective of German independent publishers) and the Frankfurt Book Fair, the Alliance presents two thematic selections on the “Reading Island for Independent Publishers” stand (Hall 4.1 / D36) ! HotList : the energy of Latin American independent publishing through more than 30 books published in Argentina, Brazil, Equator, Chile, Colombia, Mexico, Venezuela ! The HotList is available online here ! WomenList : more than 30 novels, short stories, essays and comics on feminism, women’s struggles, their emancipation across the world – these titles are from independent publishers’ lists from all continents. The WomenList’s books can be seen online. See all the programme of Lettres d’Afrique here ! For the 2018 Frankfurt Book Fair, the Alliance is partnering with Lettres d’Afrique, BIEF, the Kurt Wolff Stiftung and the Frankfurt Book Fair ; and would like to thank the organisations and people who have collaborated to the drafting of our programme (African Books Collective, Afrilivres, PEN International...). The publishers and the full programme of the Alliance in Frankfurt !